Whoa, two artsy emails so close together. You may be asking yourself if I was able to paint this one in the last two days. Nope, nothing so remarkable as that. I started Climate Change while I was waiting for successive layers of glaze to dry on the last painting. The model for this one is, Rebecca, my yoga instructor. I’ve had the idea of combining my abstract pieces with portraits for a long time. I did do one last year entitled, The Perfect Windsor, and it was a mixing of the two different styles, my version of abstracts and realism, but it was much lighter, nothing as far out as this. And this I really, really, like. In Photoshop I pasted the photograph I took of Rebecca in front of a photograph of one of my abstracts just to see how it might look and I thought it looked so great that I immediately started preparing the MDF panel so I could get to creating the abstract background. I played around with intensifying the color in Photoshop just to see how that background might look if it were even more red or more yellow or more blue and as soon as I saw how the increase of the warm tones looked I thought, wow, this looks like she’s walking through a solar storm … and there was the title, Climate Change. I used that Photoshop image as my “sketch”. I primed the panel in black like I usually do, then sketched in Rebecca with chalk pencil and painted in the first layer of her skin tones and the umbrella. Then I started painting in the abstract parts with a brush, but I did not like the way that was turning out at all. It was too manipulated looking, too predictable. The abstracts are always done by my dripping paint onto the surface of the “canvas” or throwing paint or hitting puddles of poured paint with the “drip stick” to create spontaneous splashes and dribbles and configurations that are in contrast to my usual highly controlled painting style, so here I was painting with a brush the areas that were supposed to look spontaneous and it just looked false to me. I had to mask off Rebecca and her umbrella so I could commence to drip and toss paint onto the panel to achieve the look I wanted. While that paint was still wet I lifted the mask off and let the painting lie flat for a couple of days until the thick acrylic paint was dry. Once it was dry enough to stand back up on the easel I added another layer of skin tones to her face and hand. Next I did the scarf and by the time I finished the scarf the skin was dry enough to add another layer of glazes to it. 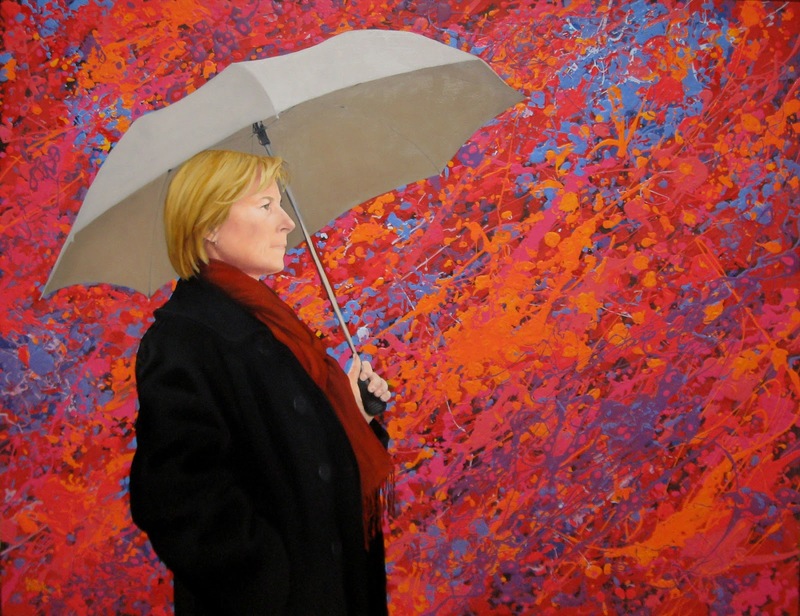 Then came the coat, then more skin glazes and then with a small brush I brought all the abstract splotches of acrylic in the background right up to the edge of the coat and umbrella, which are oil paint. Then the first layer of hair color and more skin glaze touch ups. Then I mixed up a thin glaze of red acrylic to paint over the entire background to give it a uniform “hot” feeling instead of it looking so much like the splattering of different colors that it was. The next day the final hair colors were added as well as the final skin tone touch ups. The day after that I added a slight glaze of orange to the inside of the umbrella and one more final, final skin tone glaze. And there it was. Finished. And I do, really, really like this one. This is also my final entry for the show of my paintings at Peterson’s Gallery this month, April. It is a fitting final piece, seeing as the show is mostly composed of abstracts and portraits and here I combined the two into one. This coming Friday is First Friday and the opening of that show of my paintings. Come on in and say, hi, 1925 Main Street, Peterson’s Gallery, I’d love to see you. I hope you enjoy the painting, Climate Change and as always I invite your comments. You are receiving this email because you either asked to be included, signed the guest book at Short Term Gallery in Baker City, Oregon, or you are family or friend and stuff like this just comes with the territory. If you’ve received this email in error, my apologies … if you are not interested in receiving these emails just send me an email saying so and I will remove your name from the list. If you know of someone who may enjoy receiving these emails please feel free to offer them my email address: tnovak@eoni.com : have them mention the ‘patron’s list’ in the subject box.